For other uses of "desertion", see Abandonment (disambiguation). For the geological process, see Desertification. For the novel by Abdulrazak Gurnah, see Desertion (novel). "AWOL" and "Deserter" redirect here. For other uses, see AWOL (disambiguation) and Deserter (disambiguation). In military terminology, desertion is the abandonment of a duty or post without permission (a pass, liberty or leave) and is done with the intention of not returning. In contrast, unauthorized absence (UA) or absence without leave (U.S.: AWOL /ˈeɪwɒl/; British and Commonwealth: AWL) refers to a temporary absence. if they enlist or accept an appointment in the same or another branch of service without disclosing the fact that they have not been properly separated from current service. People who are away for more than thirty days but return voluntarily or indicate a credible intent to return may still be considered AWOL. Those who are away for fewer than thirty days but can credibly be shown to have no intent to return (for example, by joining the armed forces of another country) may nevertheless be tried for desertion. On rare occasions, they may be tried for treason if enough evidence is found. Missing movement is another term used to describe when members of the armed forces fail to arrive at the appointed time to deploy (or "move out") with their assigned unit, ship, or aircraft. In the United States Armed Forces, this is a violation of the Article 87 of the Uniform Code of Military Justice (UCMJ). The offense is similar to absence without leave but may draw more severe punishment. Failure to repair consists of missing a formation or failing to appear at an assigned place and time when so ordered. It is a lesser offense within article 86 of the UCMJ. 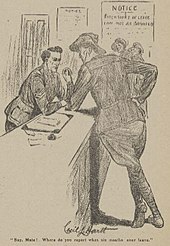 During World War I, the Australian Government refused to allow members of the First Australian Imperial Force (AIF) to be executed for desertion, despite pressure from the British Government and military to do so. The AIF had the highest rate of soldiers going absent without leave of any of the national contingents in the British Expeditionary Force, and the proportion of soldiers who deserted was also higher than that of other forces on the Western Front in France. In 2011, Vienna decided to honour Austrian Wehrmacht deserters. In 2014, on October, 24th a Memorial for the Victims of Nazi Military Justice was inaugurated on Vienna's Ballhausplatz by Austria's President Heinz Fischer. The monument was created by German artist Olaf Nicolai and is located opposite the President's office and the Austrian Chancellery. The inscription on top of the three step sculpture features a poem by Scottish poet Ian Hamilton Finlay (1924–2006) with just two words: all alone. During WWI approximately 600 French soldiers were executed for desertion. During the First World War, only 18 Germans who deserted were executed. In contrast of the Germans who deserted the Wehrmacht, 15,000 men were executed. In June 1988 the Initiative for the Creation of a Memorial to Deserters came to life in Ulm. A central idea was, "Desertion is not reprehensible, war is". During WWI a total of 28 New Zealand soldiers were sentenced to death for desertion; of these, five were executed. These soldiers were posthumously pardoned in 2000 through the Pardon for Soldiers of the Great War Act. Those who deserted before reaching the front were imprisoned in what were claimed to be harsh conditions. Order No. 270, dated August 16, 1941, was issued by Joseph Stalin. The order required superiors to shoot deserters on the spot. [dead link] Their family members were subjected to arrest. Order No. 227, dated July 28, 1942, directed that each Army must create "blocking detachments" (barrier troops) which would shoot "cowards" and fleeing panicked troops at the rear. Many Soviet soldier deserters of the Soviet War in Afghanistan explain their reasons for desertion as political and in response to internal disorganization and disillusionment regarding their position in the war. Analyses of desertion rates argue that motivations were far less ideological than individual accounts claim. Desertion rates increased prior to announcements of upcoming operations, and were highest during the summer and winter. Seasonal desertions were probably a response to the harsh weather conditions of the winter and immense field work required in the summer. A significant jump in desertion in 1989 when the Soviets withdrew from Afghanistan may suggest a higher concern regarding returning home, rather than an overall opposition towards the war itself. In the beginning of the Soviet invasion, the majority of Soviet forces were soldiers of Central Asian republics. The Soviets believed that shared ideologies between Muslim Central Asians and Afghan soldiers would build trust and morale within the army. However, Central Asians' longstanding historical frustrations with Moscow degraded soldiers' willingness to fight for the Red Army. As Afghan desertion grew and Soviet opposition was strengthened within Afghanistan, the Soviet plan overtly backfired. The personal histories of Central Asian ethnic groups – especially between Pashtuns, Uzbeks, and Tajiks, caused tension within the Soviet military. Non-Russian ethnic groups easily related the situation in Afghanistan to Communist takeover of their own states' forced induction into the USSR. 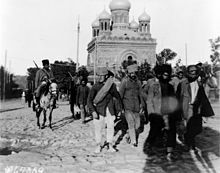 Ethnic Russians suspected Central Asians of opposition, and fighting within the army was prevalent. Upon entering Afghanistan, many Central Asians were exposed to a Koran for the first time uninfluenced by Soviet propagandist versions, and felt a stronger connection towards the opposition than their own comrades. The highest rates of desertion were found among Border Troops, ranging from 60–80% during the first year of the Soviet invasion. In these areas, strong ethnic clashes and cultural factors influenced desertion. As Afghan soldiers continued to desert the Soviet army, a united Islamic Alliance for the Liberation of Afghanistan began to form. Moderates and fundamentalists banded together to oppose Soviet intervention. The Islamic ideology solidified a strong base of opposition by January 1980, overriding ethnic, tribal, geographic and economic differences among Afghans willing to fight the Soviet invasion, which attracted Central Asian deserters. By March 1980, the Soviet army made an executive decision to replace Central Asian troops with the European sectors of the USSR to avoid further religious and ethnic complications, drastically reducing Soviet forces. Soviet soldiers entered the war under the impression that their roles were primarily related to organization of Afghan forces and society. Soviet media portrayed the Soviet intervention as a necessary means of protecting the Communist uprising from outside opposition. Propaganda declared that Soviets were providing aid to villagers and improving Afghanistan by planting trees, improving public buildings and “generally acting as good neighbors”. Upon entering Afghanistan, Soviet soldiers became immediately aware of the falsity of the reported situation. In major cities, Afghan youth that originally supported the leftist movement soon turned to Soviet oppositional forces for patriotic and religious reasons. The opposition built resistance in cities, calling Soviet soldiers infidels that were forcing an imperialist Communist invasive government on Afghanistan's people. As Afghan troops continued to abandon the Soviet army to support the mujahideen, they became anti-Russian and antigovernment. Opposition forces emphasized the Soviets' atheism, demanding support for the Muslim faith from civilians. The hostility shown towards soldiers, who entered the war believing their assistance was requested, grew defensive. The opposition circulated pamphlets within Soviet camps stationed in cities, calling for Afghan freedom from the aggressive Communist influence and a right to establish their own government. The native Afghan army fell from 90,000 to 30,000 by mid-1980, forcing Soviets into more extreme combative positions. The mujahideen's widespread presence among Afghan civilians in rural regions made it difficult for Soviet soldiers to distinguish between the civilians they believed they were fighting for and the official opposition. Soldiers that had entered the war with idealistic viewpoints of their roles were quickly disillusioned. The structure of the Soviet army, in comparison to the mujahideen, set the Soviets at a serious fighting disadvantage. While the mujahideen structure was based on kinship and social cohesion, the Soviet army was bureaucratic. Because of this, mujahideen could significantly weaken the Soviet army by the elimination of a field commander or officer. Resistance forces were locally based, more ready to address and mobilize the Afghan population for support. The Soviet army was centrally organized; its regime structure emphasized rank and position, paying less attention to the well-being and effectiveness of its army. The initial Soviet plan relied on Afghan troops' support in the mountainous regions of Afghanistan. The majority of the Afghan army support crumbled easily as forces lacked strong ideological support for Communism from the beginning. The Afghan army, comprising 100,000 men before 1978, was reduced to 15,000 within the first year of the Soviet invasion. Of the Afghan troops that remained, many were considered untrustworthy to Soviet troops. Afghans that deserted often took artillery with them, supplying the mujahideen. Soviet troops, to fill Afghan soldiers' place, were pushed into mountainous tribal regions of the East. Soviet tanks and modern warfare was ineffective in the rural, mountainous regions of Afghanistan. Mujahideen tactics of ambush prevented Soviets from developing successful counterattacks. In 1980, the Soviet army began to rely on smaller and more cohesive units, a response to mirror mujahideen tactics. A decrease in unit size, while solving organizational issues, promoted field leaders to head more violent and aggressive missions, promoting Soviet desertion. Often, small forces would engage in rapes, looting, and general violence beyond what higher ranks ordered, increasing negative sanctions in undesirable locations. Within the Soviet army, serious drug and alcohol problems significantly reduced the effectiveness of soldiers. Resources became further depleted as soldiers pushed into the mountains; drugs were rampantly abused and available, often supplied by Afghans. Supplies of heating fuel, wood, and food ran low at bases. Soviet soldiers often resorted to trading weapons and ammunition in exchange for drugs or food. As morale decreased and infections of hepatitis and typhus spread, soldiers became further disheartened. Interviews with Soviet soldier deserters confirm that much of Soviet desertion was in response to widespread Afghan opposition rather than personal aggravation towards the Soviet army. Armed with modern artillery against ill-equipped villagers, Soviet soldiers developed a sense of guilt for the widespread killing of innocent civilians and their unfair artillery advantage. Soviet deserters found support and acceptance within Afghan villages. After entering the mujahideen, many deserters came to recognize the falsity of Soviet propaganda from the beginning. Unable to legitimize the unnecessary killing and mistreatment of the Afghan people, many deserters could not face returning home and justifying their own actions and the unnecessary deaths of comrades. Upon deserting to the mujahideen, soldiers immersed themselves into Afghan culture. Hoping to rectify their position as the enemy, deserters learned the Afghan language and converted to Islam. Historically, one who was paid to enlist and then deserted could be arrested under a type of writ known as arrestando ipsum qui pecuniam recepit, or "For arresting one who received money". During the Napoleonic Wars desertion was a massive drain on British army resources, despite the threat of court martial and the possibility of the capital punishment for the crime. Many deserters were harboured by citizens who were sympathetic to them. "306 British and Commonwealth soldiers were executed for...desertion during World War I," records the Shot at Dawn Memorial. Of these, 25 were Canadian, 22 Irishmen and five New Zealanders. "During the period between August 1914 and March 1920 more than 20,000 servicemen were convicted by courts-martial of offences which carried the death sentence. Only 3,000 of those men were ordered to be put to death and of those just over 10% were executed." On May 28, 2006, the UK military reported over 1,000 absent without leave since the beginning of the Iraq War, with 566 still missing since 2005 and that year to date. The Ministry of Defence said that levels of absence were fairly constant and "only one person has been found guilty of deserting the Army since 1989". (3) without being regularly separated from one of the armed forces enlists or accepts an appointment in the same or another one of the armed forces without fully disclosing the fact that he has not been regularly separated, or enters any foreign armed service except when authorized by the United States; is guilty of desertion. 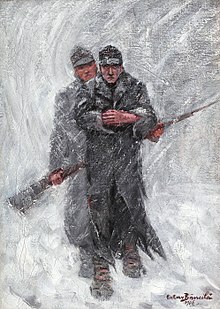 (c) Any person found guilty of desertion or attempt to desert shall be punished, if the offense is committed in time of war, by death or such other punishment as a court-martial may direct, but if the desertion or attempt to desert occurs at any other time, by such punishment, other than death, as a court-martial may direct." The desertion rate in the U.S. Army was 8.3% (9,200 out of 111,000), compared to 12.7% during the War of 1812 and usual peacetime rates of about 14.8% per year. 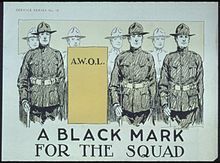 Many men deserted in order to join another U.S. unit and get a second enlistment bonus. Others deserted because of the miserable conditions in camp, or were using the army to get free transportation to California, where they deserted to join the California Gold Rush. Several hundred deserters went over to the Mexican side; nearly all were recent immigrants from Europe with weak ties to the United States. The most famous group was the Saint Patrick's Battalion, about half of whom were Catholics from Ireland, anti-Catholic prejudice reportedly being another reason for desertion. The Mexicans issued broadsides and leaflets enticing U.S. soldiers with promises of money, land grants, and officers' commissions. Mexican guerrillas shadowed the U.S. Army, and captured men who took unauthorized leave or fell out of the ranks. The guerrillas coerced these men to join the Mexican ranks—threatening to kill them if they failed to comply. The generous promises proved illusory for most deserters, who risked execution if captured by U.S. forces. About fifty of the San Patricios were tried and hanged following their capture at Churubusco in August 1847. In the Mexican–American War, high desertion rates were a major problem for the Mexican army, depleting forces on the eve of battle. Most of the soldiers were peasants who had a loyalty to their village and family but not to the generals who conscripted them. Often hungry and ill, never well paid, under-equipped and only partially trained, the soldiers were held in contempt by their officers and had little reason to fight the Americans. Looking for their opportunity, many slipped away from camp to find their way back to their home village. During the American Civil War, both the Union and Confederacy had a desertion problem. From its 2.5 million or so men, the Union Army saw about 200,000 desertions. Over 100,000 deserted the Confederate army, which was less than a million men and possibly as little as a third the size of the Union one. New York suffered 44,913 desertions by the war's end, Pennsylvania recorded 24,050, with Ohio reporting desertions at 18,354. About 1 out of 3 deserters returned to their regiments, either voluntarily or after being arrested and being sent back. Many of the desertions were by "professional" bounty men, men who would enlist to collect the often large cash bonuses and then desert at the earliest opportunity to repeat another enlistment elsewhere. If caught they would face execution; otherwise it could prove a very lucrative criminal enterprise. The total number of Confederate deserters was officially 103,400. Desertion was a major factor for the Confederacy in the last two years of the war. According to Mark A. Weitz Confederate soldiers fought to defend their families, not a nation. He argues that a hegemonic "planter class" brought Georgia into the war with "little support from non-slaveholders" (p. 12), and the ambivalence of non-slaveholders toward secession, he maintains, was the key to understanding desertion. The privations of the home front and camp life, combined with the terror of battle, undermined the weak attachment of southern soldiers to the Confederacy. For Georgian troops, Sherman's march through their home counties triggered the most desertions. Adoption of a localist identity caused soldiers to desert as well. When soldiers implemented a local identity, they neglected to think of themselves as Southerners fighting a Southern cause. When they replaced their Southern identity with their previous local identity, they lost their motive to fight and, therefore, deserted the army. A growing threat to the solidarity of the Confederacy was dissatisfaction in the Appalachian mountain districts caused by lingering unionism and a distrust of the slave power. Many of their soldiers deserted, returned home, and formed a military force that fought off regular army units trying to punish them. North Carolina lost 23% of its soldiers (24,122) to desertion. The state provided more soldiers per capita than any other Confederate state, and had more deserters as well. Over 20,000 American soldiers were tried and sentenced for desertion during World War II. Forty-nine were sentenced to death, though 48 of these death sentences were subsequently commuted. Only one US soldier, Private Eddie Slovik, was executed for desertion in World War II. Approximately 50,000 American servicemen deserted during the Vietnam War. Some of these migrated to Canada. Among those who deserted to Canada were Andy Barrie, host of Canadian Broadcasting Corporation Radio's Metro Morning, and Jack Todd, award-winning sports columnist for the Montreal Gazette. Other countries also gave asylum to deserted U.S. soldiers. For example, Sweden allows asylum for foreign soldiers deserting from war, if the war does not align with the current goals of Swedish foreign policy. According to the Pentagon, more than 5,500 military personnel deserted in 2003–2004, following the Iraq invasion and occupation. The number had reached about 8,000 by the first quarter of 2006. Another source states that since 2000, about 40,000 troops from all branches of the military have deserted. More than half of these served in the U.S. Army. [unreliable source?] Almost all of these soldiers deserted within the United States. There has been only one reported case of a desertion in Iraq. The Army, Navy, and Air Force reported 7,978 desertions in 2001, compared with 3,456 in 2005. The Marine Corps showed 1,603 Marines in desertion status in 2001. That had declined to 148 by 2005. In the United States, before the Civil War, deserters from the Army were flogged; after 1861, tattoos or branding were also used. The maximum U.S. penalty for desertion in wartime remains death, although this punishment was last applied to Eddie Slovik in 1945. No U.S. serviceman has received more than 24 months imprisonment for desertion or missing movement after September 11, 2001. Although a soldier under direct orders, in battle, is normally not subject to prosecution for war crimes, there is legal language supporting a soldier's refusal to commit such crimes, in military contexts outside of immediate peril. In 1998, UNCHR resolution 1998/77[a] recognized that "persons [already] performing military service may develop conscientious objections" while performing military service. 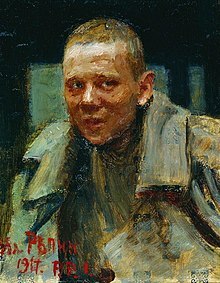 This opens the possibility of desertion as a response to cases in which the soldier is required to perform crimes against humanity as part of his mandatory military duty. The principle was tested unsuccessfully in the case of U.S. Army deserter Jeremy Hinzman, which resulted in a Canadian federal immigration board rejecting refugee status to a deserter invoking Nuremberg Article IV. The execution of soldiers for desertion is controversial, particularly considering the age of some of the soldiers and the potential of shell-shock. ^ a b Joint Service Committee on Military Justice (2012). "Article 86—Absence without leave". Manual for Courts-Martial United States (2012 Edition) (PDF). Fort Belvoir, Virginia: United States Army Publishing Directorate. pp. IV-13–IV-16. ^ a b Joint Service Committee on Military Justice (2012). "Article 85—Desertion". Manual for Courts-Martial United States (2012 Edition) (PDF). Fort Belvoir, Virginia: United States Army Publishing Directorate. pp. IV-10–IV-13. ^ Joint Service Committee on Military Justice (2012). "Article 87—Missing Movement". Manual for Courts-Martial United States (2012 Edition) (PDF). Fort Belvoir, Virginia: United States Army Publishing Directorate. pp. IV-16–IV-17. ^ Anderson, Wayne (1989). "Unauthorized Absences". In Winter, Matthew E. (ed.). The Army Lawyer (Department of the Army Pamphlet 27-50-198) (PDF). Charlottesville, Virginia: The Judge Advocate General's Legal Center & School (JAGS), U.S. Army. p. 3. ISSN 0364-1287. Retrieved 2014-06-10. ^ Stanley, Peter (2017). "Between Acceptance and Refusal - Soldiers' Attitudes Towards War (Australia)". International Encyclopedia of the First World War. ^ "Vienna to honor deserters from Hitler's army". Associated Press; The Guardian. April 20, 2011. Retrieved Jan 12, 2013. ^ "Vienna to honour Austria's Nazi army deserters". BBCNews Europe. 23 April 2011. Retrieved Jan 12, 2013. ^ a b c "Shot at Dawn". The Heritage of the Great War. Retrieved 22 July 2014. ^ Mark R. Hatlie (November 19, 2005). "Memorial to Deserters in Ulm". Sites of Memory. Retrieved 8 February 2010. ^ a b "First New Zealand Soldier Executed". New Zealand History Online. Retrieved 22 July 2014. ^ "Camp or Starvation? (NZ Truth, 1918-09-28)". paperspast.natlib.govt.nz. National Library of New Zealand. Retrieved 2016-10-29. ^ "Text of Order No. 270 Archived 2008-06-17 at the Wayback Machine". ^ a b Artyom Borovik, The Hidden War, (New York: Atlantic Monthly Press, 1990), pp. 175–8. ^ a b c Abdulkader H. Sinno, Organizations at War in Afghanistan and Beyond, (Ithaca: Cornell UP, 2008), 157–8. ^ a b c d e Gregory Feifer, The Great Gamble, (New York: Russ Intellectual Properties, 2009), pp. 97–106. ^ a b c d e f g h i j k Henry S. Bradsher, Afghanistan and the Soviet Union, New and Expanded, (Durnham: Duke University Press, 1983), pp. 206–14. ^ a b c d Abdulkader H. Sinno, Organizations at War in Afghanistan and Beyond, (Ithaca: Cornell UP, 2008), 186–7. ^ Hasan M. Kakar, Afghanistan: The Soviet Invasion and the Afghan Response, 1979–1982, (Berkeley: University of California, 1997), 136. ^ Hasan M. Kakar, Afghanistan: The Soviet Invasion and the Afghan Response, 1979–1982, (Berkeley: University of California, 1997), 175. ^ "History of Science: Cyclopædia, or, An universal dictionary of arts and sciences: Arboreus - artery". digicoll.library.wisc.edu. Retrieved 2017-07-03. ^ Linch, Kevin (11 August 2016). "Desertion from the British Army during the Napoleonic Wars". Journal of Social History. 49 (4): 808–828 – via Project MUSE. ^ "UK | Tribute to WWI 'cowards'". BBC News. 2001-06-21. Retrieved 2012-12-18. ^ "Into the Lives of Three Deserters Who Did Not Have a Good War". 9 June 2013. ^ "At least 1,000 UK soldiers desert". BBC News. May 28, 2006. Retrieved May 1, 2010. ^ J. C. A. Stagg, "Enlisted Men in the United States Army, 1812–1815: A Preliminary Survey", William and Mary Quarterly, 43 (1986), 615–45, esp. pp. 624–25, in JSTOR 1923685. ^ "see Edward M. Coffman, The Old Army: A Portrait of the American Army in Peacetime, 1784–1898 (1988) p 193". ^ Douglas Meed, The Mexican War, 1846–1848 (Routledge, 2003), p. 67. 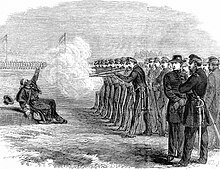 ^ a b "Desertion In The Civil War Armies". Civilwarhome.com. Retrieved 2012-12-18. ^ a b "Confederate Desertion". Etymonline.com. Retrieved 2012-12-18. ^ Mark A. Weitz, A higher duty: desertion among Georgia troops during the Civil War (U of Nebraska Press, 2005). ^ "US Navy 'jack-the-lad' deserter turned WW1 military hero". 15 April 2017. ^ Vietnam War Resisters in Canada Open Arms to U.S. Military Deserters Archived 2009-08-15 at the Wayback Machine. Pacific News Service. June 28, 2005. ^ "Vietnam War Resisters, Then and Now". Archived from the original on 2014-11-09. ^ "Deserters: We Won't Go To Iraq". CBS News. December 6, 2004. ^ a b Nicholas, Bill (March 6, 2006). "8,000 desert during Iraq war". USA Today. Retrieved 15 July 2009. ^ "40,000 US Troops Have Deserted Since 2000". Truthout.org. 2006-08-05. Archived from the original on 2009-12-26. Retrieved 2012-12-18. ^ a b Branum, James M. (2012). US Army AWOL Defense: A Practice Guide and Formbook (PDF). Oklahoma City, OK: Military Law Press. ISBN 9781300302841. Retrieved December 29, 2012. ^ Manual for Courts-Martial United States (2012 Edition) (PDF). US Government Printing Office. Retrieved 13 December 2012. ^ "Misconduct (including drug and alchohol abuse)". ^ "Marine Corps Separation and Retirement Manual". United States Marine Corps. 6 June 2007. ^ "Military Separations: COMDTINST M1000.4". United States Coast Guard. United States Department of Homeland Security. November 2016. ^ "Army Regulation 635–200 Personnel Separations Active Duty Enlisted Administrative Separations". Department of the Army. 6 June 2006. Archived from the original on 3 March 2016. ^ United Nations High Commissioner for Human Rights (April 22, 1998). "Conscientious objection to military service; Commission on Human Rights resolution 1998/77; see preamble "Aware..."". United Nations High Commissioner for Human Rights. ^ "Conscientious objection to military service; E/CN.4/RES/1998/77; See introductory paragraph". UN Commission on Human Rights. April 22, 1998. ^ "Conscientious objection to military service, Commission on Human Rights resolution 1998/77". United Nations Human Rights, Office of the High Commissioner for Human Rights. 1998. ^ D. Christopher Decker, and Lucia Fresa (29 Mar 2001). "The Status of Conscientious Objections Under Article 4 of the European Convention on Human Rights, 33 N.Y.U. J. INT'L L. & POL. 379 (2000); See pages 412–424, (or PDF pages 34–36)" (PDF). New York University School of Law, Issues – Volume 33. Archived from the original (PDF) on 22 November 2011. ^ "Hinzman Decision, Full Text Decision". IMMIGRATION AND REFUGEE BOARD OF CANADA (Refugee Protection Division). March 16, 2005. Archived from the original on 2012-07-28. Retrieved 2009-03-21. ^ "World War One Executions". History Learning Site. Retrieved 22 July 2014. Manual for Courts-Martial United States (2012 Edition) (PDF). US Government Printing Office. Retrieved 13 December 2012. David Cortright. Soldiers in Revolt: GI Resistance During the Vietnam War. Chicago: Haymarket Books, 2005. Charles Glass. Deserter: The Last Untold Story of the Second World War. Harperpress, 2013. Maria Fritsche. "Proving One's Manliness: Masculine Self-perceptions of Austrian Deserters in the Second World War". Gender & History, 24/1 (2012), pp. 35–55. Fred Halstead. GIs Speak Out Against the War: The Case of the Ft. Jackson 8. New York: Pathfinder Press, 1970. Kevin Linch. "Desertion from the British Army during the Napoleonic Wars". Journal of Social History, Vol. 49, No. 4 (Summer 2016), pp. 808–828. Peter Rohrbacher. "Pater Wilhelm Schmidt im Schweizer Exil: Interaktionen mit Wehrmachtsdeserteuren und Nachrichtendiensten, 1943–1945". Paideuma: Mitteilungen zur Kulturkunde, no. 62 (2016), pp. 203–221. Jack Todd. Desertion: In the Time of Vietnam. Boston: Houghton Mifflin Harcourt, 2001. Wikimedia Commons has media related to Desertion.